I know we declared a milk-crate moratorium back in July, but it was violated almost immediately. And now we will violate it again because we recently found something on the Internet that has left us slack-jawed. The cool-hunters have discovered the cratie. If you don’t know, a “cool-hunter” is somebody who goes out scouring the hippest urban neighborhoods trying to learn what the cool kids are doing. That somebody, of course, most likely works for a big shoe company or clothing company and stands to make a great deal of money if they discover some coolness that can be co-opted and mass-marketed. We’re not sure if the underwear-above-the-pants thing is still cool. We’re not sure why it was ever cool. But then, we are not cool so we don’t understand these things. Another example of cool-hunting might be that someone noticed that a few outrageously cool bicycle messengers in New York and elsewhere started riding fixed-gear bikes back around the turn of the millennium. And now, of course, we have Walmart selling “fixies”. Not to mention me riding one. So the coolness may be off that pumpkin, too. 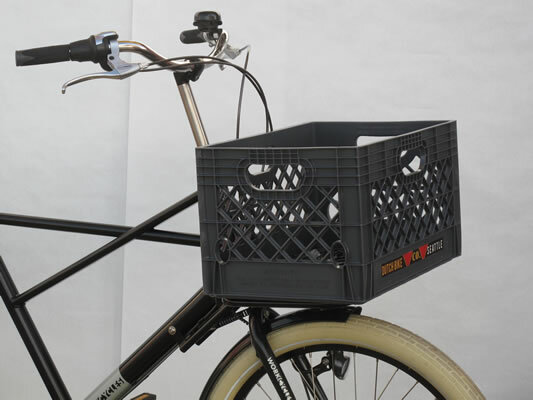 Quite a while ago we saw some beautiful, sturdy plastic crates being used on bicycles. They were incredibly durable, and seemed to work very well for hauling all kinds of things. Strangely enough, no one we asked would tell us where they got theirs, so we searched high and low for somewhere to buy them. At long last we found someone to cast them for us, and we’re thrilled with the results. Now you can have one of these without having to “liberate” it like you did when you were in college. File crate: seven bucks at OfficeMax.